Stevens got his sums badly wrong. Flickr/NHS Confederation. Some rights reserved. Last week's call from NHS regulator Monitor for NHS Trusts to fill only essential vacancies is very worrying, even if, as later clarified, the advice is directed at non-clinical staff as this has a knock-on effect on the whole workforce. Sadly this news comes as no surprise to me. The National Health Action Party has consistently been warning that the NHS is on a financial cliff edge and that underfunding threatens to push it over. 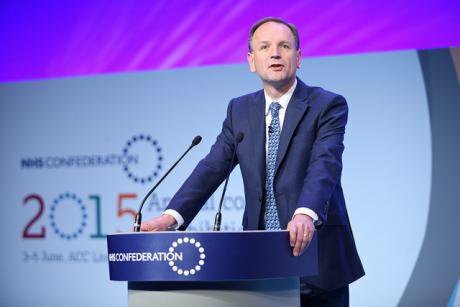 The £8bn that NHS CEO Simon Stevens asked for, and George Osborne allocated in the summer budget, is clearly inadequate as it is predicated on £22 billion of efficiency savings that even senior figures at NHS England, as well as leading health think tanks, now agree are unfeasible. The NHA Party gave fourteen separate warnings that Mr Stevens' plans were unworkable. What is particularly galling is that Jeremy Hunt is now able to bat away calls for more funding by saying he has given Mr Stevens everything he has asked for. Effectively, 'stop whingeing and get on with it'. As if that's not bad enough, Mr Hunt is at the same time demanding the NHS squeezes a fully operating seven day service out of an already inadequate budget. Research shows that charging for services merely shifts costs to those who use the system the most: sick people who tend to be the poor and the elderly. And evidence from Germany has also proven that user fees hit socially deprived groups hardest and even a small charge deterred patients from using health services. That's why they ended up dropping the so-called Praxisgebuehr charge. It is now clear that Mr Stevens has got his sums wrong and underplayed the funding requirements for the NHS to consistently deliver safe, effective and timely care. It was reported that even on the day of the launch of the Five Year Forward View, Mr Stevens and his team were still debating how much money they could get away asking for. Any good negotiator knows you aim high in anticipation of being knocked down – and you don’t claim you can make savings without being 100% sure that you can. Mr Stevens was reportedly 'disappointed' that a recent government-commissioned review of NHS productivity identified only £5bn of potential savings. Disappointed? The head of the NHS was a staggering £17bn out in his 'efficiency savings' calculations. This is totally unacceptable and will have drastic consequences for the NHS. It appears Mr Stevens has dug a hole for himself and the NHS in failing to negotiate a workable deal. When you juxtapose the growing severity of the NHS financial crisis and the now open calls to look at alternative funding models for the NHS with Mr Stevens' previous post as president of the global health division of UnitedHealth Group, a giant US private healthcare company, some people may ask: Is the NHS being set up to fail? Mr Stevens said in his 5 Year Forward View that "the NHS is the proudest achievement of our modern society". If he wants to be seen as the torch-bearer for our NHS he must openly acknowledge that the £8bn request was wholly insufficient and have the courage to call for increased NHS funding to a level that ensures the continued survival of a safe, effective and public NHS.